What does cat spaying and neutering involve? Cat spaying and neutering removes an animal’s ability to reproduce. 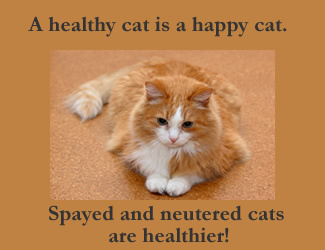 Spaying and Neutering (sterilization or “fixing”) is very common and is beneficial to both the cat and owner. In female cats, this is called spaying. In male cats, the procedure is called neutering. Cat spaying and neutering involves surgical removal of the reproductive organs. Performed under general anesthesia, the spaying or neutering procedures are safe, routine and relatively painless. A spayed or neutered cat is usually up and moving around about a day of the operation. It is not at all time consuming to do this for your cat either. Most clinics and veterinarians have you drop off your cat during morning, and the cat is usually available for pickup later that afternoon or sometimes the next day. Prices vary, but most veterinarians try to keep charges for spaying and neutering affordable. Inquire with several veterinarians and spay/neuter clinics. Remember, this is a onetime cost that provides a lifetime of benefits for you and your cat. There are currently many programs that sponsor low or no cost cat spaying and neutering. If you would like help locating low cost spay and neuter clinics in your area, I’ve provided a couple of links below that will take you to places that provide area specific referrals. In case you have heard the old wives tales, let me reassure you that cat spaying or neutering does not make them lazy or fat. 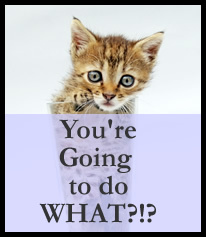 While this procedure does create some changes in a cat’s metabolism, this can be a benefit. Your cat will require less food which can save you on food bills. You should alter the amount you feed accordingly. Also, in many areas, if you can provide proof that your cat is altered, they give a good discount on licensing. Further, spayed and neutered pets are less distracted by sexual instincts and they are often become more affectionate to family members after having been spayed.Today, more people are having their cats spayed and neutered than ever before and are discovering the many benefits beyond just birth control. As you can see, there are many reasons that cat spaying and neutering is a good thing. Many veterinarians recommend "fixing" your pet as soon as possible. It has been proven that early spaying or neutering of your cat can ensure your pet a speedy and virtually painless recovery. Check with your vet or clinic for their recommendation on what age to spay or neuter. No matter when you do it, please consider having your cat sterilized, so that he or she will have a longer healthier life. And the best benefit is that you will have a more serene, loving companion for many years to come.